I got my first powder day of the season on Sunday at Silverton Mountain. Supposedly 20 inches fresh, though it was blown around so much that some ridges had less, some gullies had more. Not much terrain was open yet, but it’s supposed to snow all week. We’ll be back soon. Posted in Colorado and tagged Colorado, San Juans on December 15, 2008 May 19, 2013 by Jack Brauer. After a seemingly endless series of flights, followed by a harrowing late-night drive through a blizzard, I have made it back home to Ouray! Thus ends my 7 week adventure in New Zealand. I woke up today to waist deep snow… oh yeah. Gotta love coming home to a place that is just as beautiful as any other place you could vacation to in the world. It’s a bit daunting to try to ease back into the swing of things here. Heaps of emails, phone messages, print orders, and web projects to get moving on. And last but not least, 3200 images from New Zealand to go through! Where to begin??? I’ll probably start posting a few new photos on my gallery site every day or so, and I’ll hopefully be able to launch a complete New Zealand gallery page within the month. 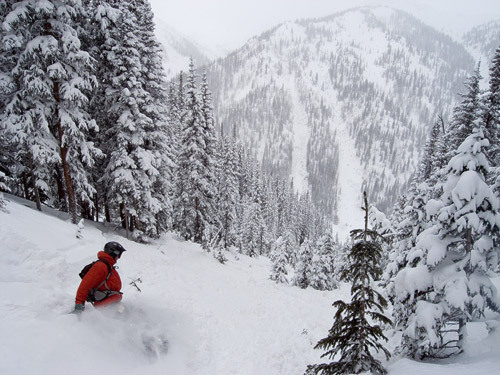 And of course, with all this new snow, I hope to be making some turns soon. Glad to be back! 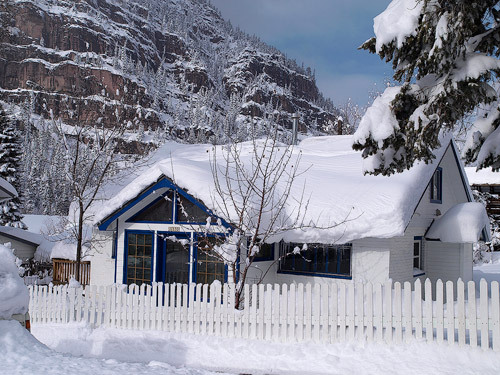 Posted in Colorado and tagged Colorado, Ouray, San Juans on December 9, 2008 May 19, 2013 by Jack Brauer. [+] This morning I woke up at 3:45am to hike up Baldy Peak in hopes of a nice dawn vista of the Sneffels Range and its golden aspens. I hiked this peak a few weeks ago, so I was familiar with the route and knew I could make good time to the summit. Nevertheless I still made it up there an hour too early, so I bundled up in my down jacket and balaclava, laid down behind some trees to get out of the wind, and took a nap for a while. Once the sky brightened enough at dawn, I was pleased to see a thick cloud bank of an approaching storm over the Sneffels Range. The warm dawn glow about a half hour before sunrise provided the perfect illumination of the range. This resulting panorama is three exposures stitched together. In my previous post, “Ouray from the Air”, you can see the same mountain range and aspen fields, from a perspective about 20,000 feet higher! 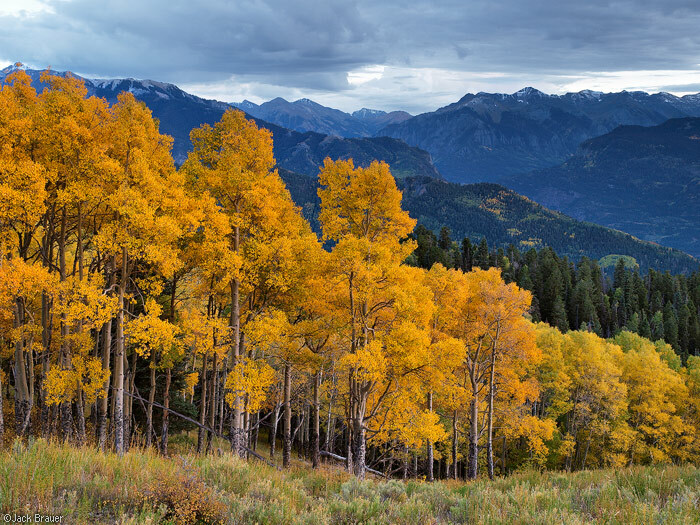 Posted in Colorado and tagged Colorado, San Juans on October 10, 2008 May 19, 2013 by Jack Brauer. 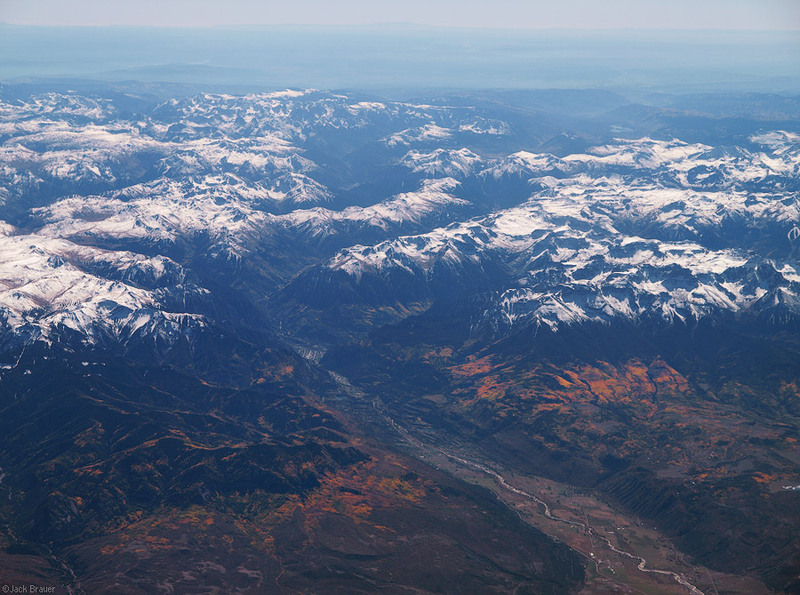 [+] On a plane ride from San Diego to Denver yesterday, we passed right by the San Juan Mountains in southwest Colorado. I had a great aerial view of Telluride, Ridgway, Ouray, and the vast expanses of the San Juans. It was helpful too to be able to see where the aspens are still colorful, and I hope to get out and photograph them in the next few days. In this shot (if you click on the photo to see the larger version) you can actually see the streets of Ouray, tucked into the mountains at the head of the Uncompahgre Valley. 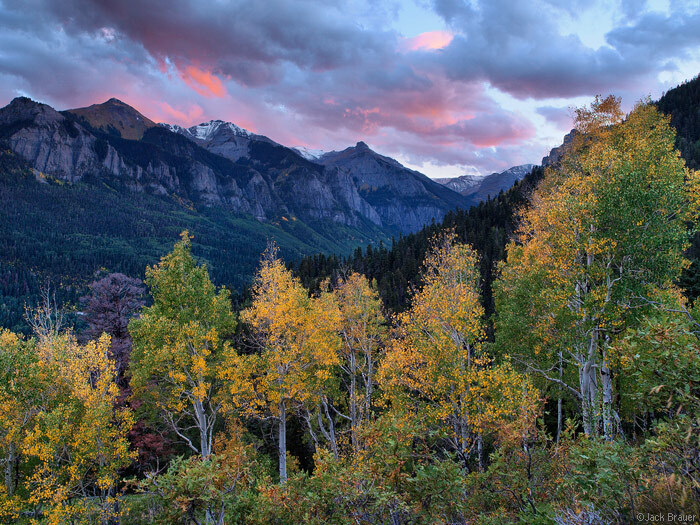 Posted in Colorado and tagged Colorado, Ouray, San Juans on October 9, 2008 May 19, 2013 by Jack Brauer. 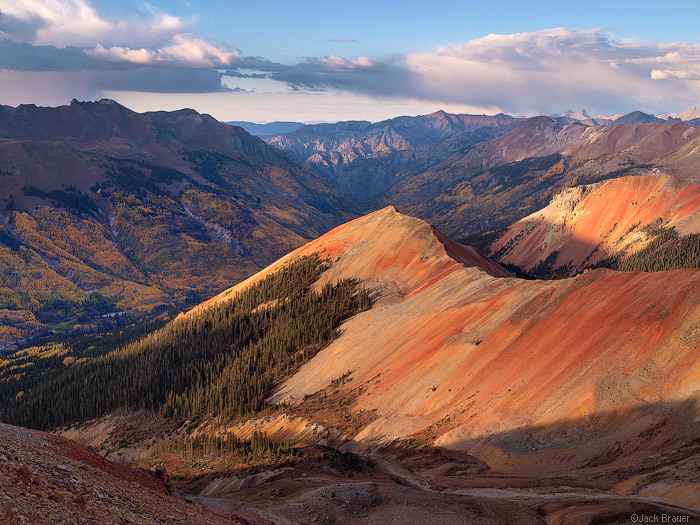 Evening light illuminates Red Mountain #2, as seen from the summit of Red Mountain #3. 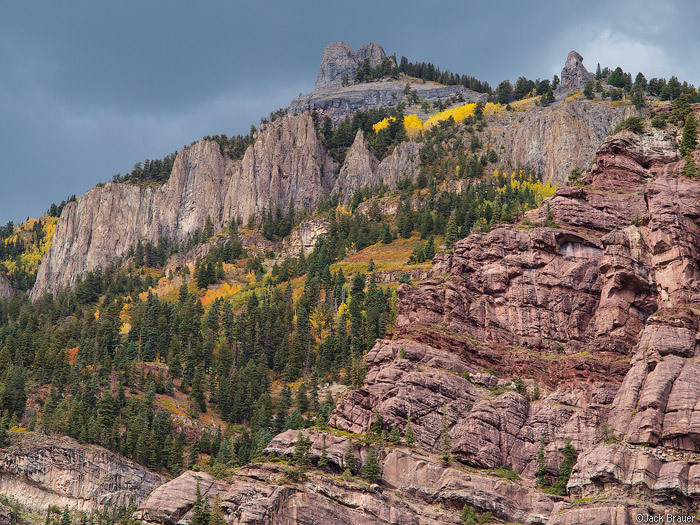 I had a really productive hike; check out my photos and panoramas from Red Mountain Pass that I made today. Posted in Colorado and tagged Colorado, Ouray, San Juans on September 30, 2008 May 19, 2013 by Jack Brauer. 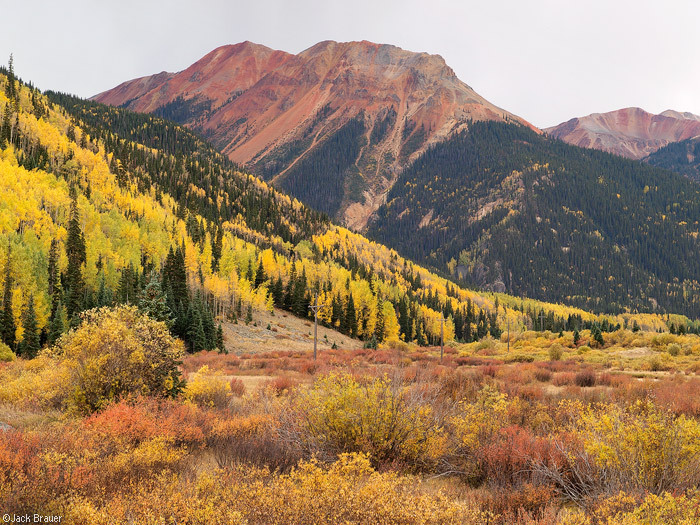 Glorious fall colors at Ironton, along Red Mountain Pass south of Ouray, Colorado. Red Mountain #1 rises in the background. There’s something so magnificent about fall which photos can barely capture. With every changing of the seasons, whether winter, spring, summer, or fall, I say to myself “This is my favorite season of all”. But it really is hard to deny that fall is the most spectacular. I don’t think that the mountains in Colorado can get any more beautiful! Posted in Colorado and tagged Colorado, San Juans on September 29, 2008 May 19, 2013 by Jack Brauer. Golden aspens high up on Baldy Peak, looking towards the Ouray valley. Posted in Colorado and tagged Colorado, San Juans on September 28, 2008 May 19, 2013 by Jack Brauer. Twin Peaks, as seen from my porch, in Ouray. This is the view I see out of my window every day as I work on the computer. It’s pretty torturous to gaze up there wishing I was hiking when I’m stuck in the office! As you can see, the fall colors are filling in around here. We also got some thunder and pouring rain from these dark clouds, which is a bit unusual this late in the season. Posted in Colorado and tagged Colorado, Ouray, San Juans on September 27, 2008 May 19, 2013 by Jack Brauer. Sunset as seen from the slopes of Twin Peaks, above Ouray, Colorado. Posted in Colorado and tagged Colorado, Ouray, San Juans on September 21, 2008 May 19, 2013 by Jack Brauer. 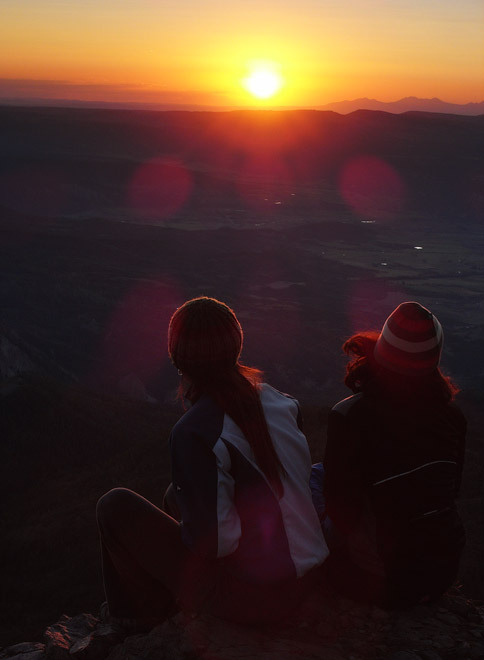 Sunset last night from the summit of Courthouse Mountain, 12,152 feet, near Ridgway, Colorado. The La Sal Mountains near Moab, Utah are visible on the horizon. Snapshot with Ricoh GX100 camera. Posted in Colorado and tagged Colorado, San Juans on September 8, 2008 May 19, 2013 by Jack Brauer.